I recently found a guitar in a dumpster, a steel-string acoustic. It's not the best guitar--an Galveston WJ-750, probably discarded by someone who gave up on guitar lessons--but it has a decent sound, and I think I can find a home for it. As a temporary measure, I've put on a set of "silk and steel" strings, which are of lower tension than standard steel strings. In the longer term, is there any way for me to reinforce the bridge that doesn't require removing and reattaching it? I don't want to go through a lot of effort for what is likely a $70 guitar, but it would be nice if I could make it last more than a few years before the bridge started peeling off by string tension. Edit: As a side question, how can I tell what glue was used to glue the bridge on? If it's a good glue like, say, hide glue (unlikely), I'd be more inclined to leave the bridge as it is. Or am I better off in the long run removing the bridge and reattaching it, despite my desire to do this on the cheap? I do understand your dilemma. I had a similar situation and continued to play the guitar while thinking about how to reinforce the bridge (used silk and steel strings and tuned it a step flat). Before I got around to taking action to prevent it, the bridge completely detached. Obviously the best way to correct your problem is to remove the bridge and remove all the glue from the bridge and top and re-glue the bridge. Lining it back up is not difficult because there will be a ghost on the top of the guitar and you can match the bridge pin holes in the top to the ones in the bridge. Unfortunately the clamps needed to do this properly cost more than taking it to a luthier or guitar repair tech. You can't get enough pressure with a clamp that would clamp against the back of the guitar without potential damage to the body. So the clamp must go inside the soundhole against the brige plate. You definitely do not want to use super glue or epoxy which is designed for permanent attachment, because there are times when the bridge of a guitar must be removed. Who knows, you may grow to really like this guitar and decide to replace the bridge one day. See below for recommended glue. Here is something you might try. Find very small wood screws. Note that the ends of the bridge are not thick enough to use a countersunk type screw head so you will need something like this (but only two). Remove all strings from guitar. Drill a pilot hole from the top on each side of the bridge. Make this hole slightly smaller than the diameter of the screw. Use a ruler to measure from each end of the bridge. Use a pointed object or awl to mark the location to start your drill bit by making a tiny indention with the tip of a sharp object (awl). The hole will keep the bit from slipping when you start the drill. After drilling the two pilot holes, remove any sawdust between the bridge and top by running a piece of paper under the bridge. NOTE: Do the following steps one side at a time. Start a small wood screw into the pilot hole on each side of the bridge but don't tighten enough to go through the bridge yet. Use an inexpensive syringe to inject an Aliphatic Resin such as Tite Bond Tight Bond Glue under the saddle. It's easy to clean with hot water and is much easier to work with than hide glue - but very strong and will allow for future removal of the bridge without damage to the guitar top. Read the reviews in the link from guitar repair folks. Work quickly before the glue dries and tighten the screw. Immediately wipe up any glue that squeezes out with a rag dampened with hot water. Then use a dry cloth to dry any moisture from the top. Obviously this is not the most aesthetically pleasing approach - but it will keep the guitar functional and playable for as long as you want. If you can find an inexpensive clamp that you can get inside the sound hole to clamp the bridge such that one side of the clamp is on the bridge on the outside and the other is on the bridge plate on the inside, you could use the syringe and glue mentioned above without the screws. If you do this, protect the finish of bridge with a soft cloth under the clamp. Luthiers have clamps for this purpose but they are rather expensive. One other thought for a more aesthetic method of reinforcing the bridge attachment is to install short wood screws from the inside of the body into the thicker part of the bridge before it starts to taper. With the strings removed you can install the first and last bridge pin as a guide to determine where to mark your starter hole. 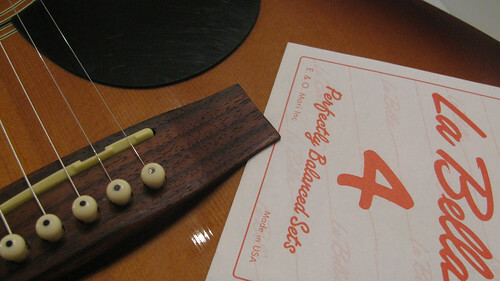 Use something like a pencil as a spacer and place it up against the bridge pin on the inside of the guitar. You may need to use a small nail as an awl due to the limited working space inside the guitar body. You want to be sure the screw is exactly the right length to bite into the bridge but not go all the way through. 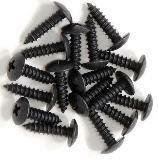 If you had screws slightly too long, you could use a washer or flat wood shim on the inside as a spacer. This would not pull down the thin edges against the body but would reinforce the attachment of the bridge to the bridge plate so that the glue joint won't fail and cause the bridge to come loose. If in the worst case scenario, remember - you didn't pay anything for the guitar so you really can't lose. But don't do like I did and just assume that lighter tension strings and flat tuning will guarantee that the bridge won't eventually come off in the absence of any action to reinforce the attachment. Good luck! If you don't want to remove the bridge the best way is to get some glue in the gap (original titebond works well) and clamp it somehow. That link is to the "luthier" section. The problem is getting the glue "in there", and then clamping it without the special tools used by repairmen. Cyanoacrylate (super glue) can be used for such repairs as it flows into small spaces well, but it has the problem that it makes parts very difficult to remove if that becomes necessary. Tends to tear the wood. Some short wood screws work if you want a cheap" NOW" fix. I wouldn't suggest it for expense guitars but, without removing string and the bridge it's reliable. Two screws on the left and right sides of the bridge,in the" tapered wings" that extend out words. Pre drilling pilot holes slightly smaller than your screws will keep from splitting issues. You might also consider using cheap hide glue for this project, namely supermarket unflavored gelatin. Frets.com has instructions for using it. You can buy a box for about $1 that will give you three packets and you'll use, at most, half a packet for this job. The hard part w/ hide glue is keeping it warm while applying it--do your work in the warmest room you can find and work quickly. Try to be neat, but don't worry too much about getting glue everywhere--you can clean it up with a warm damp rag. The benefit is that hide glue requires less clamping (which is going to be tough unless you own some really deep necked clamps) and is fairly easy to loosen (heat and warm water) if you screw something up. Not the answer you're looking for? Browse other questions tagged acoustic-guitar repair or ask your own question. What kind of glue to attach a pickguard to the face of an acoustic guitar? Solid cedar acoustic - is damage near sound hole of concern?